From Antelope feed to Zebra feed and everything in between, we can service your needs. We even offer FREE delivery to our service area. Please click on our Purina Feed Page for more details. We have been a premier real grass sod provider for over 20 years. Please click on our sod page to see what sets us apart from our competition. If you are a zoo or just an exotic animal connoisseur, Steven Fox is your man to bring that animal into the US. Click on our Exotic Animal Brokers page to see what we offer. 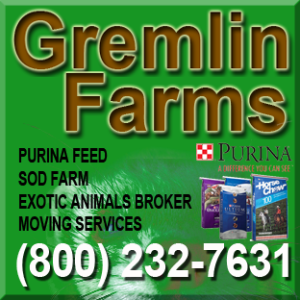 Gremlin Farms is an authorized Uhaul Partner for moving help. We will not only deliver the Uhaul, but we pack it, drive it, and unload it. We service all of Illinois. Please call (800) 232-7631.